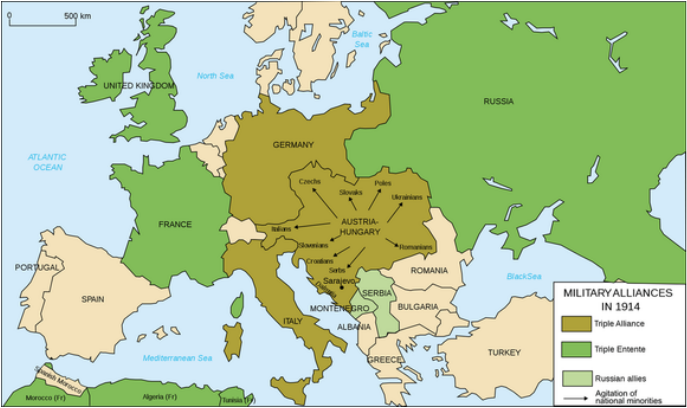 When the war ended (1918) Austria Hungary split up and became many different countries. Austria being one, and Hungary & Czechoslovakia among others. Galicia became part of Poland, Transylvania became part of Rumania, Trentino and Trieste became part of Italy. Bosnia, Slovenia, and Croatia became part of the new Kingdom of Serbs, Croats and Slovenes, which later became Yugoslavia. Hungary is reduced to an area of 93,000 sq km from the original 283,000 sq km. It's population reduced from the 18.2 million to 7.6 million. Military - The army is reduced to 30,000 men. Anschluss - Union with Germany is not allowed. Reparations - Austria was supposed to pay reparations, but the government went bankrupt before the rate could be decided. Military - The army is reduced to 35,000 men. Reparations - Hungary is supposed to pay reparations, but the amount was never set.